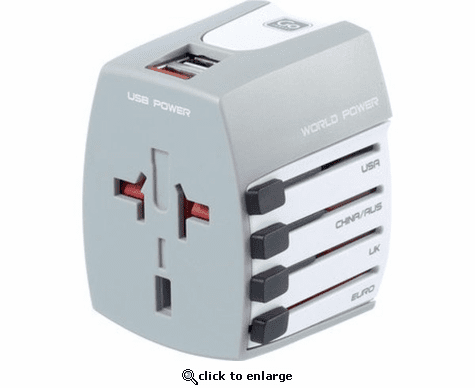 Suitable for use with the most common 2 and 3-pin / blade plugs, this non-earthed universal adapter + twin USB charger connects travelers to over 150 countries worldwide. It features 4 sliding pins that alternate between American, British, Australian and European configurations, and two USB ports with a 2.1A auto-regulating power output when dual charging (this travel adapter is suitable for use with small electrical appliances rated up to 2.5A/250V. Do not use with hairdryers). Push and hold button and slide chosen pins until it clicks into place, always return to original position when not in use.